This is a 100% honest, 100% authentic DJI Osmo Mobile 2 review. Dadtography was not compensated in any way for this post. Some links below, marked as (af), may be affiliate links. Sales made resulting from clicks on affiliate links provide a small percentage of each sale to Dadtography.com. All images are originals. Please don't use our photos without permission. I've been using the Osmo Mobile 2 now since March of 2018. I had an original Osmo Mobile that I used for over a year before that as well. How does the Osmo Mobile 2 perform and how does it compare to the original? Those are a few of the questions I wanted to answer. With more and more people creating video for platforms like YouTube and wanting to produce better quality video, gimbals or stabalizers have exploded in popularity over the past few years. The competition is fierce and DJI is known for its drones, but how does their mobile phone gimbal stack up? For recent examples of videos shot using the Osmo Mobile 2, check out my YouTube channel. How is the build quality on the Osmo Mobile 2? Good but not great is a simple way of putting it. The first impression that you have of any product is the unboxing. The box and packaging was one thing that Apple got really "right" with its products a long time ago. They knew the experience of the customer even just holding that box for the first time meant a lot. DJI seems to have learned that lesson as well, as they don't appear to skimp on their packaging that the Osmo Mobile 2 arrives in. But packaging is really only a first impression. "Is the Osmo built well?" is the real question. Yes, I would say overall the build quality of the actual Osmo Mobile 2 unit is good. It's made of "high-strength composite material", which was clearly intended to lower the weight of the unit compared to the original Osmo Mobile. They achieved that goal - it does feel a bit lighter. But the unit also feels a little more cheaply made than the original Osmo Mobile as well. The feel of the grip on the Osmo Mobile isn't quite as sturdy feeling as the original. That said, I've yet to have any built quality related issues with my Osmo, and I'm no mechanical engineer. So, I guess we'll see if the Osmo holds up to regular use over time. What are the key features on the Osmo Mobile 2? Pretty easy setup, but does it have industry leading features? The Osmo line of mobile phone gimbals are pretty simple and easy to use. But when it comes to mobile phone gimbals, is there enough feature differentiation to make things like price a secondary concern when purchasing one? I would say, the Osmo Mobile 2 got a little smarter in some ways, and a little dumber in other ways compared to the original Osmo. Below are a few of the key features of the Osmo 2. The biggest, no-brainer "upgrade" the Osmo Mobile 2 received is standard USB charging capabilities. Osmo Mobile 2 has a built-in battery. 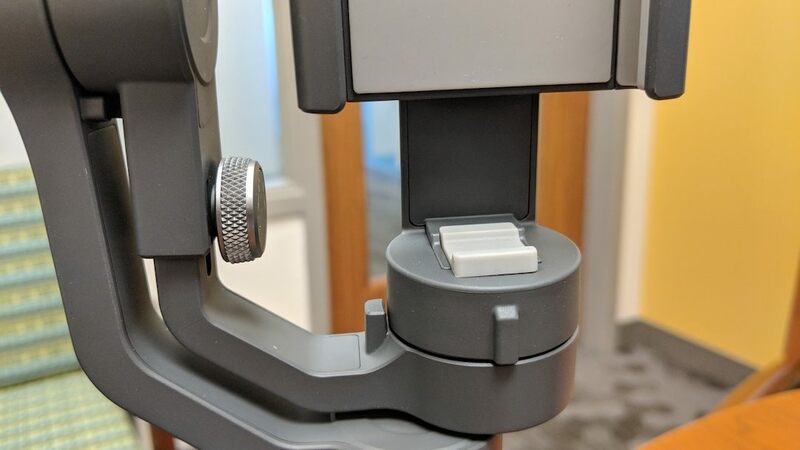 Call it a "feature" or a downgrade, the DJI Osmo Mobile 2 no longer has removable or replaceable batteries. Osmo Mobile 2 comes with a built-in rechargeable battery. In my experience, the battery life on the built-in is extremely good. Osmo Mobile 2 can do portrait camera mode. One of the biggest downsides to the original Osmo Mobile gimbal is that it couldn't shoot in "portrait" mode. Well, they've fixed that with the Osmo Mobile 2. The camera mount allows both landscape and portrait modes. Osmo Mobile 2 has standard USB charging. Again, a definite upgrade over the original Osmo, the Osmo Mobile 2 now includes standard USB charging. This is a huge benefit, since you no longer need a non-standard plug to charge your gimbal. Osmo Mobile 2 has zoom, pan and tilt controls. 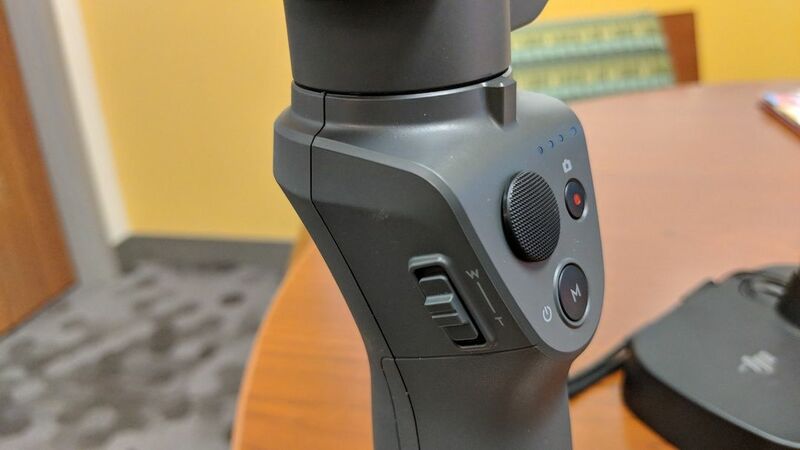 Most of the controls are pretty standard on the Osmo Mobile 2 and include a side-mounted zoom control, and front-mounted pan, tilt, power and photo controls. Is the Osmo Mobile 2 easy to use? Easy to use, but it takes some getting used to. The Osmo Mobile 2 mobile phone gimbal is pretty easy to use, but it definitely can take some getting used to. I always find the initial setup and bluetooth connection between the gimbal and the phone to be somewhat challenging. It's best to connect the phone and gimbal via bluetooth outside of the DJI app first. Once you get them connected, open the DJI mobile app and power the gimbal on. The app should recognize the gimbal and you should be prompted to connect them. They should stay connected as long as both the phone and gimbal are powered on. As far as the gimbal controls go, they're fairly straight forward and customizable if you want to change them up. The pan and tilt speed is probably one thing you'll want to setup to your unique preferences. Some people like fast controls while others prefer slower. How durable is the DJI Osmo Mobile 2? Despite a first impression of being a bit more cheaply built compared to the original Osmo, the Osmo Mobile 2 does appear to be pretty durable. The only issues I've ever had so far are more with my phone than with the gimbal. Heavy use seems to overheat my phone, especially in warmer climates outdoors, my phone would overheat and I would have to shut it down for a bit before continued use. It's important to note that the Osmo Mobile 2 is neither water resistant nor waterproof. I have almost forgotten that a time or two and almost got it wet. I'm not sure if splashing a bit of water would really do anything to it, but certainly submerging it in water wouldn't be a good thing. I did drop my Osmo Mobile 2 during our last international trip. I was worried at first, but it survived the drop like a champ. 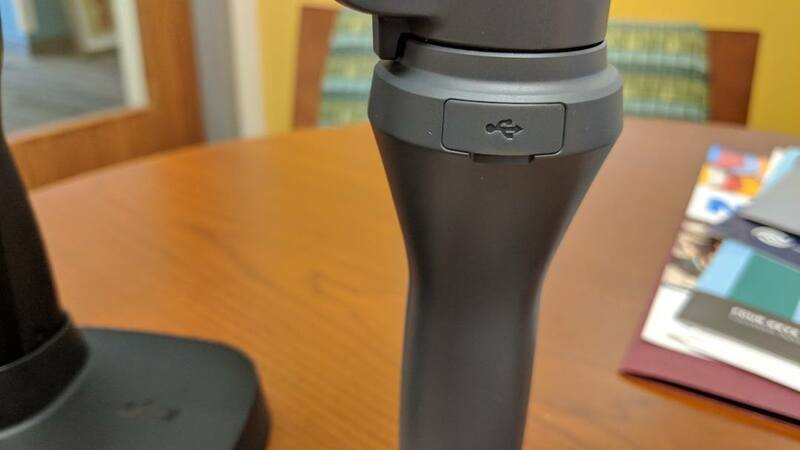 Some final thoughts and overall impression of the value of the Osmo Mobile 2. Overall, I've really be very satisfied with the Osmo Mobile 2 gimbal. It's got some quirks, but what electronics device doesn't? 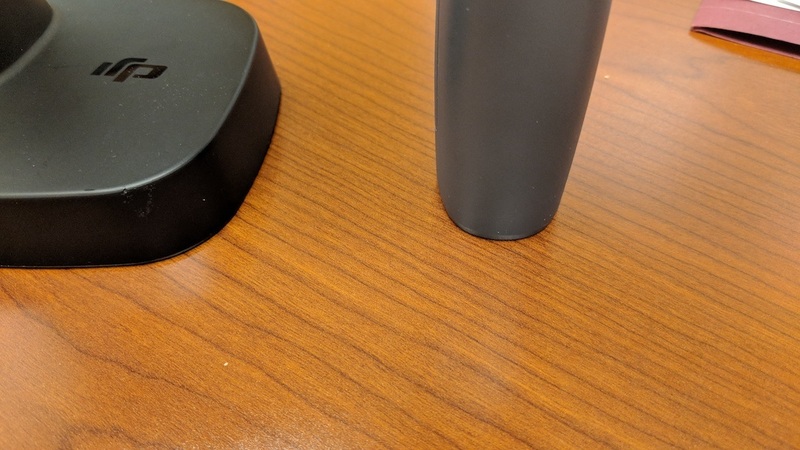 One important thing I have noticed in using my Google Pixel 2 XL phone with the Osmo is that the USB-C adapter really makes it difficult to plug a microphone into the phone while it's on the gimbal. In other phones that have a more standard microphone plug that is not on the bottom of the phone, it works just fine. I almost considered going back to my Samsung Galaxy for this reason alone. Have you used a DJI Osmo Mobile 2 or other similar gimbal? Share your thoughts in the comments below!